Japanese Prime Minister Shinzo Abe is reportedly set to visit ­China in late October to mark the 40th anniversary of the signing of the peace and friendship treaty between the two ­countries and to improve bilateral ties, after he met Chinese President Xi Jinping at the Eastern Economic Forum in Vladivostok, Russia held in early September. Some media reports have quoted a date of October 23 for the visit; a more recent report suggested the trip would be pushed back a day or two at the request of the Chinese side. Ties between China and Japan have been strained since Japan announced it would nationalize the disputed Diaoyu Islands (known as Senkaku in Japan) in 2012, which triggered strong protests from China. Although Abe has previously traveled to China to attend international summits, the October visit to China, if it happens, would be the first bilateral trip by a Japanese leader since 2011. Abe first proposed a China visit during a meeting with Xi on the sidelines of the Asia-Pacific Economic Cooperation (APEC) forum held in Vietnam, in November 2017. The leaders agreed that the meeting should mark a fresh start to relations between the two ­countries. In the same month, a business delegation of 250 representatives from Japan led by Japanese Business Federation Chairman Sadayuki Sakakibara and Japan Chamber of Commerce and Industry Chairman Akio Mimura visited China, where they held talks with their Chinese counterparts to discuss cooperation between the two countries’ private and public sectors. Then in May 2018, Chinese Premier Li Keqiang visited Japan, the first visit in eight years by a Chinese premier. Li wrote in the ­Japanese newspaper Asahi Shimbun that China-Japan relations stood “at an intersection for returning to a normal path of development.” It was reported that Li proposed the resumption and expansion of a currency swap arrangement between their central banks. The previous arrangement had expired in 2013 amid rising tensions over territorial disputes. More recently, on August 31, Liu Kun, China’s Finance Minister, and Taro Aso, Japan’s Deputy Prime Minister and Finance Minister, co-chaired the Seventh China-Japan Finance Dialogue. China’s State-owned Xinhua News Agency said the meeting had injected “positive energy” into the bilateral relationship and global and regional economics. Behind the changing tone of the rhetoric at high-level meetings, the economic relationship appears to have warmed up again. According to data released by the Japanese authorities, the total volume of ­bilateral trade for the first three months of 2018 between China and Japan increased by 10.1 percent to reach US$76.4 billion. Japan’s exports to China increased by 14.2 percent, accounting for 18.5 percent of its total exports, while imports from China increased seven percent, accounting for 22.8 percent of Japan’s total imports. Analysts believe that after years of stagnation in bilateral economic cooperation, economic ties between the world’s second- and third-largest economies are finally getting back on track. 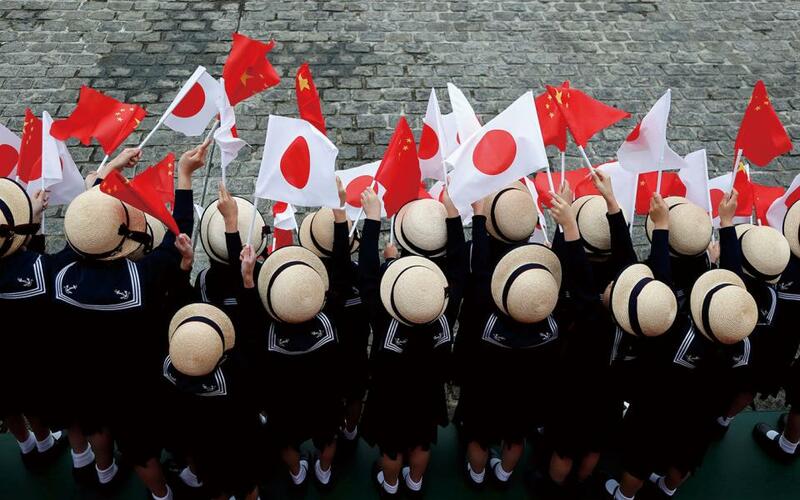 It may be no coincidence that China and Japan’s efforts to improve their relationship are happening against a backdrop of trade frictions between the US and China. While the trade conflict has simmered and escalated in recent months, Japan also faces pressure from the US regarding their bilateral trade relationship. Upon assuming the presidency in early 2017, US President Donald Trump pulled the US out of the Trans-Pacific Partnership (TPP), a free trade pact involving 12 countries that Japan had been actively promoting. In November 2017, US Commerce Secretary Wilbur Ross urged Japanese automakers to reduce exports from Japan and Mexico while boosting production in the US in order to slash the huge trade deficit. The US and Japan also failed to reach a deal that would exempt Japan from the US’s steel and aluminum tariffs. During the first round of trade talks held in August between US Trade Representative Robert Lighthizer and Japanese Economy Minister Toshimitsu Motegi, the two sides failed to reach an agreement on whether to open up negotiations on a bilateral free trade agreement. While Washington has been complaining about its huge trade deficit with Japan, Tokyo has been trying to fend off US demands for a free trade agreement and avert potentially steeper tariffs on its exports. As the US resumed sanctions on Iran in August, it asked Japan to halt oil imports from the country. Given Iran is a major source of oil for Japan, Tokyo has been seeking a waiver, although its appeals so far appear unsuccessful. It is unclear whether Japan will completely terminate oil imports from Iran. But on August 2, Japan’s Foreign ­Minister Taro Kono held talks with Iranian Foreign Minister ­Mohammad Javad Zarif in Singapore on the sidelines of the ASEAN Foreign Ministers Meeting. Kono reiterated that Tokyo has upheld the 2015 nuclear agreement reached by Iran and six major powers, rhetoric that would surely irritate Washington. In late September, Abe met Trump in New York City on the sidelines of the United Nations General Assembly, and in early October, it was announced that Tokyo and Washington had signed a trade deal limited to agricultural products, which experts said indicates Abe still wants to take leadership of the reformed TPP. Nevertheless, according to an article published by the Economist in early September, concerns over Japan’s relationship with the US are “prompting Japan’s leader to step up his efforts to fashion a more independent and assertive foreign policy,” which includes mending fences with China. Despite the improving economic relationship, there is no sign that China or Japan will back down from their territorial dispute over the Diaoyu Islands. For several years, coast guard vessels from both ­countries have routinely shadowed each other in the waters ­surrounding the islets. While China continues to send patrol vessels, Japan has also been strengthening the presence of its coast guard to counter China’s moves. In 2017, Japan added five large new patrols to its coast guard fleet and increased the number of coast guard personnel by more than 200. In January 2018, the Japan Times reported that the Japan Coast Guard was planning to build bases for seven new large patrol ships to boost its response time. In March, Japan unveiled a plan to launch an amphibious rapid deployment brigade, widely regarded as Japan’s version of the US Marines. With a 2,100-strong force, it will comprise a mainstay amphibious unit and a landing unit equipped with amphibious ­assault vehicles and Osprey transport aircraft, which are currently used by the US Marines. On August 28, Japan’s defense ministry released its annual defense white paper for 2018. A big portion of the paper is devoted to China’s national defense system and its maritime activities in the East and South China Seas, which the paper said constitutes “a strong concern” for Japan. The document immediately drew protest from China. Few believe that the political and military relationship between China and Japan will see a major rapprochement in the foreseeable future. But with an improvement in economic ties, the recent ­period, dubbed “cold economics, cold politics,” may be drawing to a close, to be replaced by the resumption of what many describe as “hot economics, cold politics,” which has characterized the China-Japan relationship for much of the time since the normalization of the bilateral relationship in 1978. While the territorial disputes between the two countries may ­persist, there is still room to develop economic cooperation, after ­concerted efforts in the last few years to manage their disputes. By the end of 2017, China and Japan had engaged in 15 rounds of security dialogues, 13 rounds of strategic dialogues, and eight rounds of high-level maritime talks. On May 9, the two countries agreed to set up a “conflict communication mechanism,” which includes a ­hotline, to prevent maritime and air incidents over the disputed islands in the East China Sea. It also provides for regular meetings ­between both nations’ defense officials and a mechanism for their naval vessels to communicate at sea to avert maritime incidents. Regarding trade issues, both China and Japan support multilateralism. This is the realm where Japan’s policies depart from ­American policies the most. Following the US’s withdrawal from the TPP, ­Japan persuaded the remaining countries to reach a new deal called the Comprehensive and Progressive Agreement for Trans-Pacific Partnership (CPTPP). Earlier, Japan had signed a separate free-trade pact with the European Union, creating the world’s biggest bilateral free-trade area. Japan is also actively promoting the Regional Comprehensive Economic Partnership (RCEP), which involves the 10 member states of ASEAN as well as five regional countries – China, India, Australia, New Zealand and Japan. While Japan has resisted China’s Belt and Road Initiative and refused to join the China-led Asian Infrastructure Investment Bank, its policy has evolved from reticence to acknowledging the potential synergies in recent months. During the keynote meeting between Xi and Abe held in November 2017 in Vietnam, Abe said Japan could offer help with the Belt and Road Initiative and proposed that Japan and China cooperate in doing business in third countries. In recent years, China and Japan have been competing for infrastructure projects, especially high-speed rail projects throughout South and Southeast Asia. But since the Xi-Abe meeting in 2017, the two sides have started to explore potential areas for cooperation. In May 2018, the Japan Bank for International Cooperation proposed that a joint Japan-China consortium build a high-speed railway ­system in Thailand, which, if it materializes, would be the first time contractors from both countries would be working together on an infrastructure project in a third country. On September 25, China and Japan held the first meeting of a joint public-private committee on economic cooperation in Beijing. Analysts believe that agreements on infrastructure and other projects would be signed during Abe’s upcoming visit to China in October. After years of animosity, the dynamic changes in global geopolitics have granted both countries a rare chance to look beyond their ­political disagreements to enlarge their scope for economic ­cooperation. ­Leaders from both countries should seize the opportunity, which will help reduce regional tension and promote peace and prosperity to a region that is increasingly challenged with uncertainties.